School’s back… from… summer. You’re little one may not be excited to go back to class — completely opposite from you, right! — but that time apart doesn’t give him or her free reign to eat junk. Knowing what’s on the lunch menu is a big part of ensuring your little one’s eating habits are healthy even when you’re not around. Kids Culinary Adventures is writing healthy lunch menus for The Lunch Masters, a Bay Area Lunch Program monitored by a professional dietitian that serves 100 percent organic, hormone-free foods that are completely biodegradable. Check to see if your school participates with the program. If not, chances are the food offered is high in saturated fats and lacking in nutrients. Just because your school doesn’t subscribe to Lunch Masters doesn’t mean your child can’t eat well. Chef Gigi has some great tips! Did you make your child’s favorite dinner last night? Use an insulated lunch box and serving dishes to maintain the food at its proper temperature and send them what remains. Avoid pre-packaged lunches whenever possible! They’re typically high in fat, sugar and empty calories as they’re processed and packed with sodium. Involve your child in both planning and preparing their lunch. Not only are they more likely to eat it, but they’re learning as they go! Lean lunch meats and whole grain breads can make a healthy sandwich, but eating one daily is boring! Switch it up with other healthy offerings like crackers and cheese, a hardboiled egg, or—gasp! Dare we say veggies? —a salad. Planning can save you lots of time. Get in the habit of making lunches with leftovers while you’re serving dinner. This might mean slicing and bagging a few additional fresh veggies or fruits. Make fruit juice your friend. Freeze a 100 percent juice box overnight; remove from the freezer and place in a plastic baggie. Your plastic-wrapped drink will be super cold when lunch time rolls around and will keep foods cool—i.e. super safe for your little one —at the same time. Lastly, try something new! Getting into the kitchen together can mean creating a meal at home that then doubles as tomorrow’s lunch. Spread one inner surface of banana bread with 1 ounce of plain cream cheese. Spread the other piece with honey and sandwich. Serve with a whole or sliced wedge apple. Step one might be making banana bread. Here’s a recipe courtesy of our dear friend Marion Cunningham who scribes the Fannie Farmer Baking Book. Preheat the oven to 350 degrees and grease and flour a baking pan. Stir and toss together 2 ½ cups of flour, 1 teaspoon of salt and two teaspoons of baking soda. In a large bowl mix 1 cup vegetable shortening, 2 cups of sugar, 2 cups of mashed ripe bananas (which should be about 6 medium-sized bananas), 4 eggs slightly beaten and 1 cup of chopped walnuts. Pour into a prepared pan and bake for 65 to 70 minutes. You’ll know it’s done when you can insert a knife and it comes out clean. Let it cool in the pan for 5 minutes. Then transfer to a wire rack and let it cool completely. 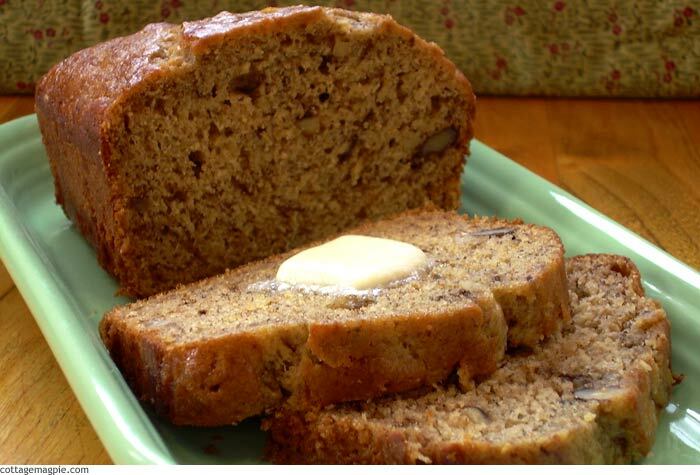 Now you have banana bread to enjoy on its own or as a tool for making new lunch time goodies.